Good Book says the world's caught in a long, dark night, waiting for a brand new dawn to come and sweep all that darkness away. Don't know if that'll ever happen, but I do know this: there's folks set on making things darker. They're looking for ways to break the laws the Good Lord set for all of nature's ways. I've seen it happen, and the night's getting darker and longer. Sometimes I think I mightn't ever see the sun come up. A new story in the "Water of Life" chronicle begun in Promethean: The Created, set in Detroit. 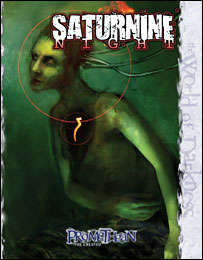 Saturnine Night is a supplement for Promethean: The Created.